Three each revolved through CNN and the Washington Post; two through ABC News; and one each via the Chicago Tribune, Los Angeles Times, Newsweek and Time magazine. The email, written by Time reporter and fellow Columbia grad Jay Newton-Small, said Briscoe would be serving as deputy associate director of public affairs for the Office of National Drug Control Policy as of Monday. "Despite his multiple basketball games with our commander-in-chief, he always brought a skeptical eye to his work and in conversations about the candidate," Newton-Small wrote the email. Newsweek's online bio, which may be taken down soon, reports Briscoe joined the magazine's Washington bureau in 2004 after three years with the Los Angeles Times. Warren Bass: Washington Post deputy editor (of the Outlook section) > adviser to United Nations Ambassador Dr. Susan Rice. 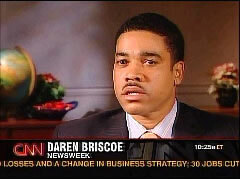 Daren Briscoe: Newsweek Washington correspondent > Deputy Associate Director of Public Affairs for the Office of National Drug Control Policy. Jay Carney: Time magazine Washington bureau chief > Assistant to the Vice President and Director of Communications for Vice President Joe Biden. Linda Douglass: ABC News Washington correspondent (previously with CBS News) > senior strategist and senior campaign spokesperson on the road for the Obama campaign, now Assistant Secretary for Public Affairs at the Department of Health and Human Services and leading spokesman for Obama's health reform. Kate Albright-Hanna: CNN producer > director of “new media” (online video) for the Obama campaign, “content lead” for the Obama transition Web site. Peter Gosselin: Los Angeles Times Washington correspondent > speechwriter for Treasury Secretary Tim Geithner. Sasha Johnson: CNN senior political producer > Press Secretary at the Department of Transportation. 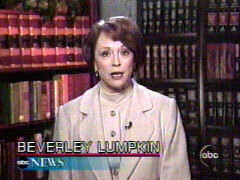 Beverley Lumpkin: Justice Department correspondent for ABC News > Press Secretary at the Justice Department. Aneesh Raman: CNN Middle East correspondent > worked in communications for the Obama campaign. Vijay Ravindran: Chief Technology Officer for Catalist, a voter database provider which worked for the Obama campaign > Chief Digital Officer and Senior Vice President of the Washington Post Company. Rick Weiss: Washington Post science reporter > communications director and senior policy strategist at the White House Office of Science and Technology. Jill Zuckman: Chicago Tribune Washington correspondent > Director of Public Affairs for the Department of Transportation.